Peace Pals fosters understanding and respect for the diversity and oneness of the human family and the natural world through its various and creative activities. By nurturing inner peace and global awareness in the leaders of tomorrow, Peace Pals will help create a future in which peace and harmony become a way of life. The MY HERO Project’s mission is to use media, art & technology to celebrate the best of humanity one story at a time. By honoring their heroes in essays, art and short films, people of all ages are empowered to realize their own potential to effect positive change in the world. Please visit: www.myhero.com for more information on the MY HERO Project. Have children host a World Peace Flag Ceremony by creating their own World Flag Cards. Please download these three PDF documents. Flags of The World Coloring Pages (195 Coloring Pages of World Flags). Repeat until all of the countries are said. For more information on World Peace Flag Ceremonies – Click Here. 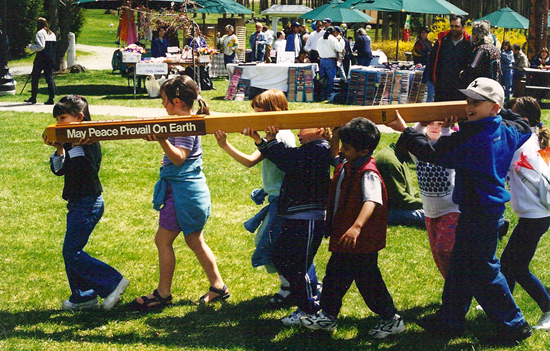 Peace Pals International offers a booklet which is filled with activities geared toward children. Download your copy of the Peace Pals International Activity Guide. The booklet includes instructions for children on how to create their own Peace Pole using paper.